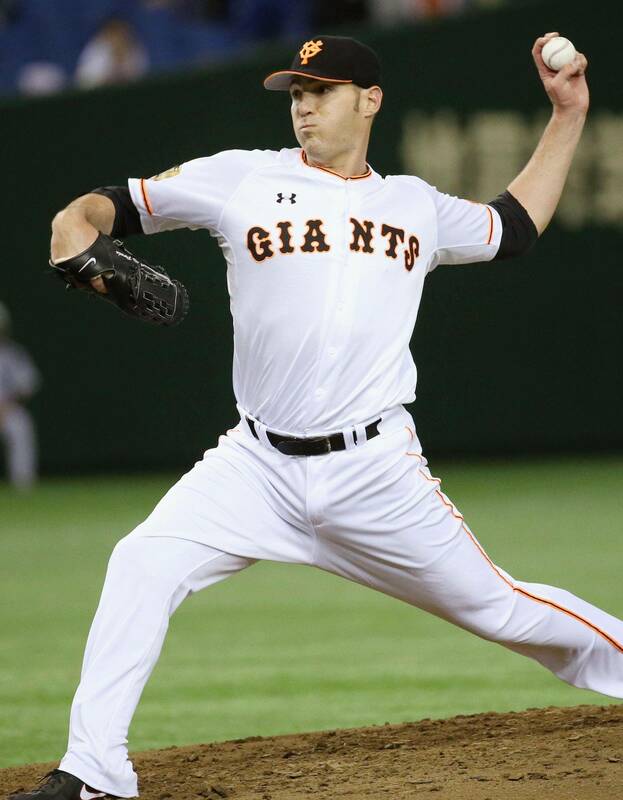 Despite an initial phase of uncertainty about moving to Japan, new Yomiuri Giants lefty Aaron Poreda appears to be taking well to pitching in unfamiliar territory. 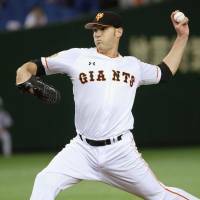 On Sunday, Poreda got his first taste of his home park’s mound with two scoreless innings in a 4-2 exhibition defeat to the Central League rival Tokyo Yakult Swallows at Tokyo Dome. Poreda showed good movement on his fastball in a 35-pitch effort. The 28-year-old allowed no hits, while walking one and striking out one. Poreda, who pitched 26 games in relief last season for the Texas Rangers, his fourth big league club, was very effective with that fastball up and in and should be a real handful for opposing hitters when he has more time to work his secondary pitches into his game than short exhibition stints allow. “(In the States) I usually progress. I’d throw two innings, then three, then four,” Poreda said. “But they (Giants) might not want to show me so much, perhaps as a surprise, so I worked just two innings. And to keep progressing, I threw more in the bullpen. “I’m working on my changeup and curve, and you need those when you go deeper: four, five, six innings. You can throw them in the bullpen, but you don’t know how effective they’re going to be unless you throw them in a real game. One of the surprises for pitchers accustomed to reporting to big league camp in the middle of February is seeing their new Japanese teammates dialing it up in long bullpen sessions from the first day of spring training on Feb. 1. “It’s intimidating. The guys come ready to go,” Poreda said. “They throw a lot, so being a competitive guy, I want to throw as much as they do, but I know my arm can’t handle it at that point in time. But now I’ve kind of shown them. That’s why I want to throw extras, so I can show them that I want to be a starter, I can throw 100, 150 pitches. One thing coaches often want to iron out with foreign pitchers, especially big ones — and Poreda is listed as being 198-cm tall — is a slide step to shorten the motion to the plate and keep runners from taking liberties on the bases. “I’m working on it,” he said. “I’ve always had a slide step, so it’s not that big of a deal, but I’ve just got to be more conscious of it or the Japanese hitters are going to take advantage of me and I can’t let that happen. Originally a first-round draft pick of the Chicago White Sox, Poreda has played in three major league cities and for a handful of minor league clubs, but Japan was something entirely different for he and his wife. Ginowan, Okinawa Pref. — Hiroshima Carp ace Kenta Maeda gave Central League hitters something new to worry about on Sunday, when he tried out a slider with a different break in a practice game against the Yokohama BayStars. It was already bad enough for other CL clubs that the Carp kept Maeda around this season by not posting him to the majors, but the unusual vertical break he got against the BayStars can’t be a good thing for opposing batters this year, provided he can master it. “It’s something I can only do now, so I want to really get a feel for it,” said Maeda, whose best pitch has been a tight-spinning slider thrown with pin-point precision. Maeda tested out this “new pitch” for the first time in an intrasquad game on Wednesday, but wanted to try it against two of the BayStars’ better right-handed hitters, Aarom Baldiris and Jose Lopez — who joined Yokohama over the winter from Yomiuri. “It wasn’t bad,” Maeda said of how they reacted to his new weapon. “I think I can start using it now. Maeda, who is virtually a lock to start on Opening Day for the Carp, allowed one hit in three scoreless innings against the BayStars, getting out of his biggest jam with a double play off a two-seam fastball. “On Opening Day, I want to be lights out,” he said.